Ford unveiled its new-generation Fusion sedan in January last year at the Detroit Auto Show and just a year followed it up by unveiling the NASCAR version of the same. This is in fact the third time that Ford has launched both the production model and the NASCAR version simultaneously. The first time it happened in 1968 when the company launched its Torino sedan and then again it happened with the earlier Fusion model in 2006. The NASCAR version of the new Ford Fusion looks pretty sleek and aggressive; exactly what a race car should be like. Although it is meant to be a racing vehicle, the 2012 NASCAR variant shares similarities in terms of proportion with its production cousin. The proportion similarity was intentional as Ford wanted it to appear like its production variant. Apart from just the proportion, there is similarity in look as well between these two vehicles and that similarity becomes all the more obvious if you compare the grille, the headlights and the tail-lights of both the cars, where it seems the designers just copied these three elements from the production variant and pasted them onto the NASCAR version. It took the design team a year to come up with this baby, which was a blessing in disguise for the team as it gave them enough time to prepare for the race. The team was led by Garen Nicoghosian of Ford Design Center and aerodynamicist Bernie Marcus. 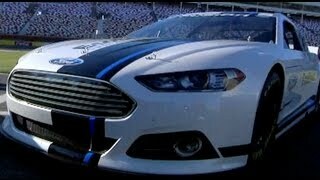 The 2013 Ford Fusion NASCAR will take to the track in anger for the first time a year from now at the 2013 Daytona 500. For the rest of this year, the car will be put through its paces by the Ford NASCAR team to get it ready for the upcoming challenge. Ford Racing unveils 2013 Fusion NASCAR Sprint Cup redesign at Charlotte Motor Speedway during NASCAR Media Tour. 2013 Sprint Cup car features full redesign by Ford designers to mirror 2013 Fusion production car and return brand identity to the track. 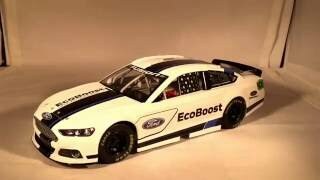 New Fusion race car will debut at Daytona 500 in February, 2013. CONCORD, N.C., Jan. 24, 2012 – Manufacturer brand identity is back in NASCAR. The 2013 Ford Fusion NASCAR Sprint Cup car, unveiled today as part of the Charlotte Motor Speedway Media Tour, was worked on by Ford designers in an effort to bring brand identity back to the sport.The result is undeniable with the 2013 Sprint Cup car mirroring the recently unveiled 2013 Ford Fusion production car. This marks the third time Ford simultaneously launched production and NASCAR versions of a new model. The first dual launch came in 1968, with the sleek fastback Ford Torino. Legendary NASCAR driver David Pearson drove the Torino to back-to-back NASCAR championships in 1968 and 1969. The second time came in 2006, when the then newly introduced Ford Fusion appeared in showrooms and on the track. 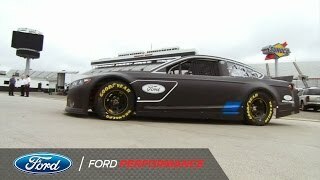 Ford took a different approach with the development of the 2013 Fusion racer. Ford Design Center staff, led by Garen Nicoghosian, and Ford aerodynamicist Bernie Marcus, spent the past year doing the early design development, freeing up the Ford race teams to concentrate on weekly NASCAR competition. 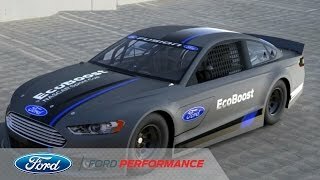 Ford designers, led by Nicoghosian, addressed three main issues to mirror the 2013 Sprint Cup Fusion to the 2013 production Fusion found on showroom floors. Designers addressed the overall proportion of the race car to reflect proportions found in the production Fusion. Brand and design cues in the side of the vehicle. An identifiable front end grill with the distinctive look of a Ford.